After the fallout Apple has experienced from banning thousands of “overtly sexual” apps from its now squeaky clean App Store, it came as a bit of a shock Wednesday when some developers reported that an “explicit” category had suddenly popped up in the automated app submission process. Perhaps less surprisingly, the category mysteriously disappeared later in the day, before any explicit-branded apps actually appeared for sale in the App Store. Apple already maintains parental controls for the iTunes store, and uses the “17+” rating for material deemed inappropriate for young eyes, meaning the mechanism to bar kids from adult content already exists. 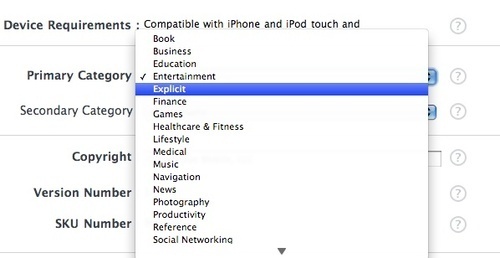 While that might make the “explicit” tag seem redundant, Apple already uses it for music and movies, which might have offered Apple some consistency across categories: One checkbox and the kids are safe. Is there still hope for the return of apps like Wobble iBoobs? Maybe. According to Gizmodo, one developer contacted Apple regarding the explicit tag after it cropped up and was told, “it’s not going to happen anytime soon,” which could mean Apple just needs to calculate its moves more carefully to avoid walking into another PR disaster like the one its already embroiled in.